La Promenade Plantée: Walk on Air! Guest blogger Simone Blaser takes us on a walk along Paris’ elevated promenade, a spectacular place to stroll, even in winter! Sometimes the French just get it right. 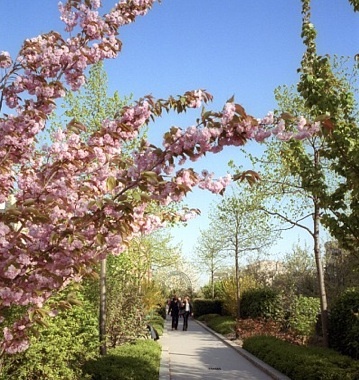 For the 20 years preceding the buzzy unveiling of Manhattan’s Highline Park, Parisians have quietly enjoyed their own walk-in-the-sky: the promenade plantée, a 4.5-kilometer respite from the often overbearing honks and crowds that can conquer even the best-planned day in Paris (the best laid schemes of mice and men and all of that). This respite is a garden, a journey, a picnic; it’s a moment to breathe and walk under an arcade of trees and colors; a moment to appreciate the marriage between nature and architecture. 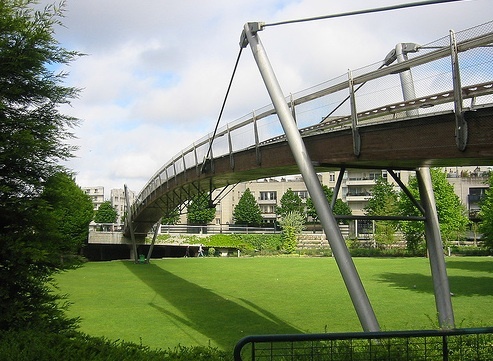 The promenade plantée is Paris’ very own elevated park. The park extends from just behind the Opera Bastille to the Porte de Saint Maur, a stone’s throw from the Bois de Vincennes on Paris’ eastern edge. It sits on what was once a railway that connected the Bastille to the suburbs of Paris, in service from 1859 to 1969 and no doubt the product of Baron Haussman’s grand renovations of Paris. 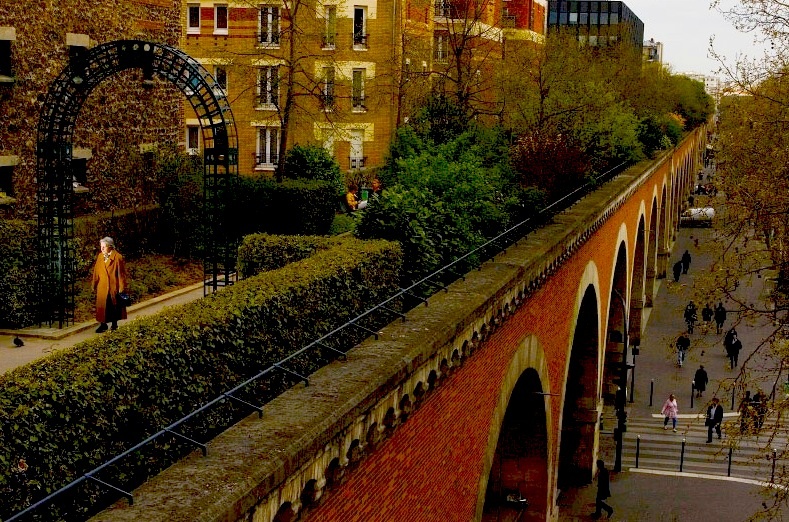 In 1988, the landscape architect Philippe Mathieux and the architect Jacques Vergely resuscitated the abandoned railway viaduct to create a green space unlike any other in Paris. It’s an assault of color: shades of greens and pinks and whites and yellows change with the seasons, but never disappoint. 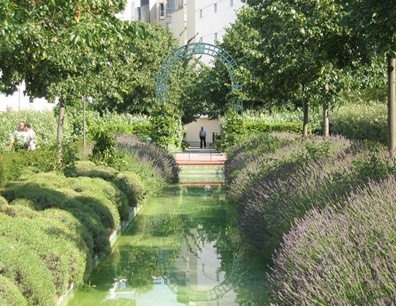 Wild vegetation and modern landscaping complement the buildings, both modern and historical, that surround the promenade. Architectural ornaments—invisible from the street level—suddenly reveal themselves. Be sure to look out for the varied ironwork that frames the balconies of older buildings, chimney pieces reminiscent of reed pipes, and even some graceful caryatids that hold up the weight of an art-deco building. The promenade fleurie is perhaps Paris’ largest window-box of flowers. As always, the best sightings are those you don’t expect; so above all, visit this park with eyes (and ears!) ready to be surprised. Bring along your children and your leashed dog and, for an afternoon at least, walk on air. 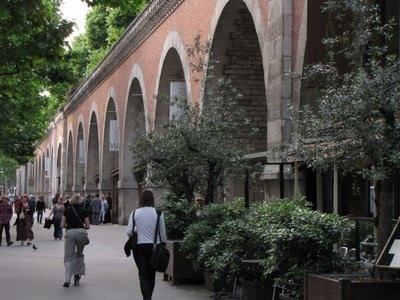 Don’t forget about the Viaduc des Arts: the 70 renovated archways below the railway that now house dozens of artists’ ateliers, galleries, furniture showrooms, a restaurant and cafe. Metro: Bastille (Lines 8, 5, 1) and Ledru-Rollin (Line 8). Enter at 38 rue de Lyon (Paris, 75012) or 280 avenue Daumesnil (Paris, 75012) or various points in between. Edited by Tory Hoen for the HiP Paris Blog. Looking for a fabulous vacation rental in Paris, Provence, or Tuscany? Check out Haven in Paris. Andi – Glad we were able to share it with you! We hope you enjoy it next time you are in Paris. My husband and I travel to Paris 1-2 times a year and I did not know about this place, it looks magnifique, I am definitely adding it to my next trip!